"The billing related fields in Salesforce are not getting updated. This used to work fine, but stopped working all of a sudden." If the BluSynergy applications are invoking Salesforce in the context of a user account that was not configured by BluSynergy personnel, then make sure that the "Require users to log in" setting is set to "The first time they use this application". This setting is accessed via the "Setup" menu and then [Manage Apps >> Connected Apps]. 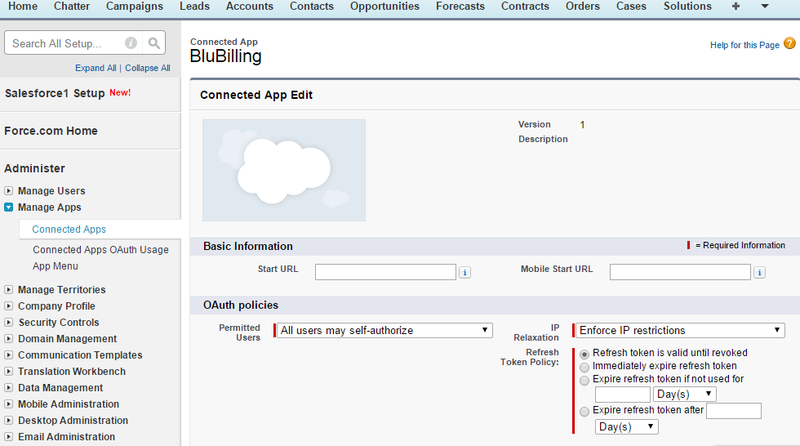 In the list of connected apps, select the "Edit" link for the BluSynergy application. On this [Edit Connected App] page, under the OAuth Policies section, make sure you have "The first time they use this application" selected. This permits use of a refresh_token to refresh the access_token to make authenticated API requests. Note: this typically results in "expired access/refresh token for customer X" messages in the system logs. See the screenshots below for reference. Another cause is that you have exceeded the API limits imposed by Salesforce.